Every year we organize the Grape Wall Challenge and ask consumers to blind taste 40 wines that retail for under rmb100. Most of the country’s biggest importers / distributors participate: they supply up to four wines — two red and two white — with no more than two labels from any one country. Given most of these companies have nationwide reach, we get, for our sample size, a nice cross-section of what is available in China. What does this have to do with a blog post about Argentine wine in Beijing? Lots. Wines from that country have done very well during five years of Grape Wall Challenges. Consumers not only like the fresh aromatic Torrontes entries and fruity round Malbec ones but also wines made with everything from Viognier to Cabernet Sauvignon. Despite the appealing taste of these wines and despite Argentina being among the world’s top-six wine producers, the country has a small presence in China. With a 2 percent share of wine imports last year, it was far behind smaller producers like Australia (13 percent) and Chile (9 percent). That is one reason I went on a wine tour of Argentina in June (post coming). And why I wanted to create an event called the ArgenChina Wine Tour, held in Beijing last Saturday. We need more such wines in consumers’ hands. This is the second tour I have helped organize in the Sanlitun area of Beijing. The first — The China Wine Tour in April — involved 40 consumers visiting four venues and trying eight local wines made with grapes from six regions. The ArgenChina Wine Tour sought to improve on that first event. First, rather than have one big group of tasters, we created three smaller ones of ten people each, with one group starting the tour each hour. Ten seems like a good number of people to split a bottle of wine — each person gets a half-glass — and doesn’t overwhelm a given venue. 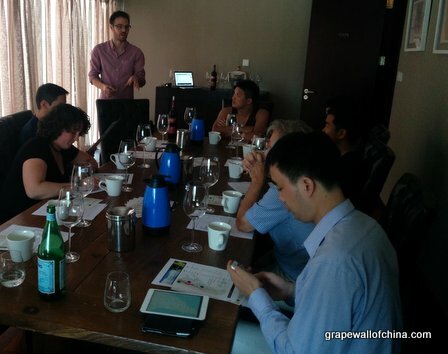 Second, we had many no-shows for the China Wine Tour, about 35 percent, which is all too common in Beijing. For the ArgenChina tour, I sent many reminders and emphasized the event’s value: we charged rmb150 for 11 wines, some snacks and a Schott Zweisel glass that itself retails for ~rmb100. We had a 100-percent attendance rate this time around. The idea was to feature wines from throughout Argentina. We ultimately had 11 wines from Salta (Colome), La Rioja (San Huberto), San Juan (Calia, Osaada), Mendoza (Terrazas, O’Fournier, Salentein) and Patagonia (Chacra), thus covering north, central and south regions. Grape varieties included Torrontes, Chardonnay, Malbec, Tempranillo, Pinot Noir, and Syrah. We also had a few snacks, including alfajores, and tango performances / lessons at the finish. Here is the tour, stop by stop. Owned by importers / distributor ASC, The Wine Gallery is a three-story venue with retail, education and event spaces. We started upstairs in one of the event rooms and handed each member a tour map and a glass to carry during the day and later take home. Andrew Maidment of Wines of Argentina then gave an introduction to the country’s key regions and answered questions. We also tried our first two wines, both from Colome, an operation in the Salta region that includes a vineyard at over 3000 meters and some vines over 150 years old. The floral Torrontes struck some people as unusual at first but quickly caught on due to its freshness, fruitiness and superb acidity. The rich and fruity Malbec Reserve also got general approval. Both of these wines ranked among my favorites of the day. This is the flagship restaurant in Opposite House, a boutique hotel just a short walk from The Wine Gallery. We sat at the bar while Matthew Bell introduced us to two wines from Terrazas in Mendoza. Sureno paired the Reserve Chardonnay with a ricotta cheese and smoked salmon bruschetta topped with truffle oil, while the Reserve Malbec had several bruschetta options, including spicy salami and parma ham topped with tomato oil. All of them worked well. I liked the smooth and slightly creamy Chardonnay as a counterpoint to the Torrontes one stop earlier. Numerous people in the group I visited with enjoyed the Malbec. This restaurant is considered among the best in Beijing and includes a South American twist — two of the owners hail from Colombia and Venezuela respectively. I think including restaurants like Mosto and Sureno is important because they ultimately carry wines they believe they can sell, that is, wines their customers will enjoy. We started with a San Juan chardonnay under the label Osaada. This is a standard expression of the grape and I have tried it at Mosto’s sibling cafe Moka (same building, first floor) for rmb30 during happy hour (4 PM to 7 PM daily). We then had a Malbec-Tempranillo from O. Fournier in Mendoza, an intriguing operation that also sells some vineyard space to investors, including a few from China, and then makes wines on their behalf. I liked the red blend with its fresh berry and slightly smoky and grassy aromas. It’s well-made — and good value at rmb198 per bottle. I also opened a bottle of dulce de leche — milk and sugar cooked until it takes on a caramel character — that I brought back from Argentina. Each member tried a small spoonful, then we ate two alfajores, a kind of cookie that includes dulce de leche and that I sometimes pick up at Moka (three for rmb15). This is my “local“: I like The Loop’s modest but intriguing portfolio and have attended many tastings here, including a few where I brought Chinese wines. We tried two wines sourced by Wines of Argentina. The first, Chacra “Barda” Pinot Noir from Patagonia, tended to be a crowd-pleaser, save for a few attendees who are not fans of this particular grape. Lots of pleasant cherry and toasty aromas along with complex flavors that increased as the wine breathed. This wine was presented by Marion Pansiot. The second wine, San Huberto Cabernet Sauvignon Reserve from La Rioja, was bigger and bolder. Violet, dark fruit and oak aromas, with a somewhat jammy body, amplified by following that lighter Pinot Noir. This wine was presented by Pansiot and Sherry Pei. My plan to pair these wines with empanadas fell through at the last-minute so we had tasty sausage rolls and bacon and cheese rolls from nearby Two Guys and a Pie. Those hit the spot after three hours of tasting and traveling. Owned by importers / distributor Torres China, this shop was our final stop. We tried three wines and enjoyed tango. Everwines waived the usual rmb80 corkage fee, which meant we could buy bottles at retail prices — from rmb87 — and enjoy them on the front patio, back patio or inside. I also learned the key lesson of this tour: eleven wines is a lot. Most of us were tipsy on arrival and this meant predictable incidents, like people free-pouring and thus taking too much wine or members of earlier groups using the bottles of later groups and resulting in people being unhappy they didn’t get a particular label and thus only tried ten wines — which is what we promoted — instead of eleven blah blah blah. Sorry Everwines! You guys were the first stop on the China Wine Tour and the last stop on the ArgenChina Wine Tour and both times dealt with some issues! Anyway, the lineup here included two bottles from San Juan: Calia Chardonnay-Torrontes, a light and simple wine that would be fantastic for a picnic, and Calia Shiraz-Malbec, also easy-drinking and well-priced at less than rmb100. We also had Salentin Malbec Reserve from Mendoza, which seemed to be the source of trouble but received good reviews from those who tried it. Overall, the event covered a good range of Argentine wines and drew an interesting mix of people from numerous countries, professions and age groups. One person suggested providing more info on ordering the wines and I’ll aim to do so in the future. Future events might also see smaller pours — say 50 ml instead of 75 ml — and thus allow us to keep the same number of wines, speed up the tour and get people to that final destination with clearer heads. I think more such tastings would be good, perhaps on a bigger scale and reaching out to more Chinese consumers, and have a vision of ArgenChina Wine Tours happening simultaneously in numerous cities. Or maybe that’s just the wine talking! Anyway, the next event will likely be a new and improved version of the China Wine Tour. If you’re interested in joining, let me know at beijingboyce (at) yahoo.com and I’ll send details when everything is ready to go. Thanks to the venues and distributors who supported ArgenChina, including Alex Cros at China Wine & Spirits (Schott Zweisel), Jeanne Wang and Vicky Mo at The Wine Gallery, Themis Kouris and Matthew Bell at Sureno, Anna Lin Yip and Steven Yang at Mosto, Weiley Lu, William Riquet and Amy at The Loop and Damien Shee and Sarah Xiang at Everwines. Thanks to Andrew Maidment and Wines of Argentina for sourcing tango dancers and wines and jumping in to deal with last-minute logistical crises, to Marion Pansiot and Sherry Pei for presenting wines, to Marian Larrain Hurtado of La Cava for design / printing assitance, and to Matt Wong and Andrew Papas at Two Guys and a Pie for handling snacks on short notice. Finally, thanks to everyone who attended and made this a fun day.